Random Tuesday Thoughts is my favorite weekly linkup. I don't always participate, but I try when I can. If you'd like to link up your randomness, head on over to Stacy Uncorked. She'll be glad to have you. What started off as one Thirty-One party turned into a chain reaction. I've been to three of the in-home bag parties in the last couple of months and have another to attend in December. 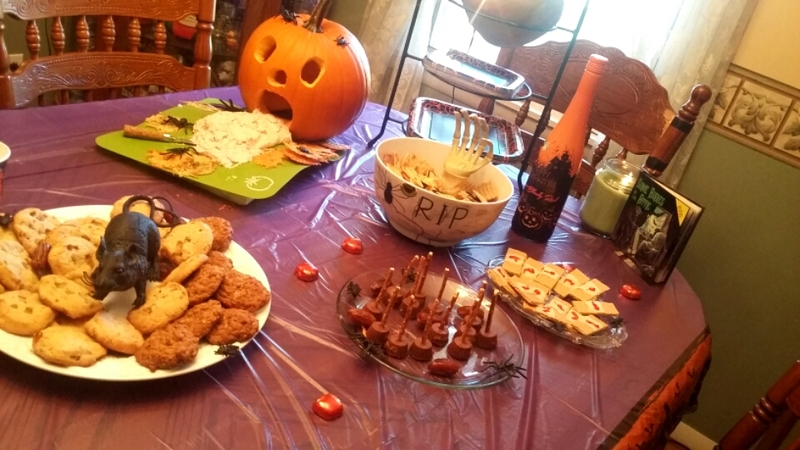 The last one I went to on Sunday had an impressive spread of Halloween-themed food, including a "puking" pumpkin. When I had my party, I was lucky to have store-bought cupcakes to serve. Me with Uncle BJ and Curt. My Uncle John passed away unexpectedly last month. He had no desire for a service of any kind, so no one really got a final goodbye. Saturday I did get the chance to see my other two uncles for a "celebration of life" in remembrance of my Uncle John. It was nice reminiscing of a great man, and catching up with family I hadn't seen in years. Although, it'd be nice to get together with the entire family (immediate and extended) for something other than a person's death. Just sayin'. I saw some things I've never witnessed before when I went to Ecuador. One of them had me rollin'. Driving by, I noticed a black dog hanging out in a hole in the wall. He'd look left, then right, perfectly content watching traffic. Have you ever attended a Thirty-One party or purchased from the company? Emma looked beautiful in her Homecoming attire. so sorry about your uncle. That spread is looking mighty delicious, wish it was on my table, lol!! My condolences for the sudden loss of your uncle. You are right it's better to get everyone together for a happy reason than to wait for a loss. Sorry to hear about your uncle! Yes, we go all out for Halloween. I love this time of the year. It's my favorite!